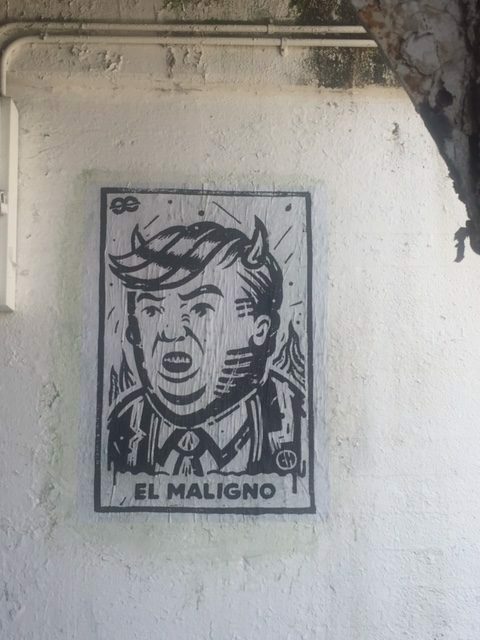 A “new” Lotería card appears spray-painted on a viaduct in Chicago’s near Southwest Side. When I arrived at my first-period sophomore class on November 9, the morning after Election Day, I thought back to the freshmen’s clouded faces after reading Elie Wiesel. The students who clustered around the doorway now were uncharacteristically subdued. No one frantically searched for tape to fix a last-minute physics project, helped braid a friend’s hair, or reenacted a penalty shot from a recent soccer game. On 26th Street, the main shopping district in Little Village, business has dipped significantly in 2017. In the past, the bright assemblage of restaurants, clothing shops, and Mexican bakeries boasted a yearly revenue second only to Michigan Avenue’s Magnificent Mile, downtown. Now, some businesses report as much as a 30% loss in profits. Latino and non-Latino owners alike are affected. On Sundays after church, the streets stand quieter than in the past, when families and tourists used to crowd the area. My students actually predicted this ghostly scene back in 2008, but for a different reason. One day in class after President Obama’s first election, I mentioned the possibility of having a Latino president sometime in the near future. The freshmen disagreed vehemently. Surprised, I asked why. Our own city had just sent the country’s first African-American President to the White House. The students argued that it would be even more complicated with a Latino candidate. While he (or she) might be a legal citizen, he might still have undocumented relatives in the U.S.
To many Hispanics, the new president is known as Donald “Trompudo,” an offensive term that generally means “pig-snouted” or “big-lipped.” Like Napoleon, the dictator pig of Animal Farm, he leads by intimidation. After the election, my students were muted at first, but gradually began to reveal their concerns about undocumented friends, peers from elementary school they corresponded with on Snapchat or Instagram. Students sometimes asked me questions about rumors of ICE round-ups that they had seen on social media or heard about from relatives. I offered as many facts as possible, such as Chicago’s encouraging designation as a “Sanctuary City.” As a class, we were already working on research and ways to determine the reliability of sources. I hoped that knowing how to evaluate information for accuracy would make them better-informed, especially at a time when the term “fake news” would be flung around by the new president and take on a neo-Orwellian meaning. Our sophomore class was reading The Odyssey last November, so we focused a lot on the theme of “xenia” or hospitality. Everyone in the poem, from prince to swineherd, must welcome the most ragged strangers into their homes. My instinct as a teacher has always been to connect literature with current issues and themes, but for the first time in 12 years of teaching Homer, I felt like the 2,800-year-old epic might actually be out of date. More likely, the attempt to revive nationalist fears of other races and classes was manifesting itself in ugly aggressions. His wife nodded grimly. I asked about the children, who are American-born citizens. The couple broke into smiles. “They didn’t want to worry us,” the husband added. I managed a smile, but knew that if I were in their place, discussing the prospect of suddenly having to leave my own two children (and country), I would have broken down. Somehow, these parents were able to look past their own grief and fear. An estimated half of all undocumented immigrants in the U.S. pay federal and state taxes that amount to about $12 billion a year. Most of these individuals hope to create a path toward citizenship or a paper trail to fend off deportation. In order to file, an undocumented worker must apply for an Individualized Taxpayer Identification Number (ITIN). For years, the Internal Revenue Service has maintained that it never shares data with Immigration and Naturalization Service (currently called ICE). Now the process of paying taxes with an ITIN will be more risky, especially under a new administration that is already pushing for increased, shared databases of information (such as the Pence-Kobach Advisory Committee on Election Integrity). “Welcome to the Trash-Talking table,” said the signs in Spanish and English taped to the tall blue recycling can. “Let all of your frustrations out here.” Brown Emoji “poop” symbols decorated the signs. On the table nearby, plain slips of paper and colored pencils awaited. The Trash-Talking table was one of the stations set up in a church basement for community use at a solidarity event. The participants did not fill the pews that night, perhaps because of the weather or the reasonable fear that ICE could attempt to target such an event. At the door, everyone received a small white candle for later in the evening. As we listened to the bilingual program, I saw a young woman in a nearby pew run the unlit wick of her candle along her jaw. One of the night’s illuminating speakers, a Japanese-American nun, spoke about her parents’ two years in a WWII, Japanese internment camp. “They weren’t death camps, but the suffering was psychological,” the nun said. Set in the high desert, the camps had stark lodgings and plenty of barbed wire. Despite the barrenness, the residents managed to find ways to improve their environment. They gardened and landscaped to transform their surroundings. “Art has the role of being able to [exist] in a place that is difficult,” the nun observed. She also spoke about Ralph Lazo, a brave, Mexican-American teenager who had volunteered to go to the camp along with his Asian friends and neighbors. He played on the camp’s baseball team and could be seen smiling in the group photo. It was hard not to think of my students when I saw Lazo, and heard about his loyalty and selflessness. A rabbi said a blessing at the end of the night, and we processed out of the sanctuary with our newly lit candles. I walked straight into the windy night with my candle, and it quickly extinguished. Another woman relit it. As we marched, I noticed that the older members of our group instinctively cupped the flames with their bare hands to deflect the wind. Jane Addams’ historic Hull House stands approximately a mile from the church that held the solidarity event that night. In 1889, the future winner of the Nobel Peace Prize founded the social services settlement (with Ellen Gates Starr) on Chicago’s Southwest Side to improve the lives of impoverished immigrants hailing from countries including Ireland, Italy, Russia, and Poland. My own Italian grandparents came to Chicago in the 1920s and settled on the West Side. My father, Sergio, spoke no English until his first day of kindergarten. While his immigrant father toiled at a metals factory, my father also worked long hours as a teen, and earned scholarships through college and graduate school. After serving in the Army for two years, he worked as an electrical engineer for decades. He even volunteered at the high school where I teach, as a guest-lecturer in chemistry. Almost 60 years separated my father in age from the students, but he felt at home with the children of immigrants who worked to finance their tuition. Many of my former students have already followed paths similar to my father’s. Only, there are key differences between their early experiences and those my father faced: drugs and street violence had not yet infiltrated the immigrant neighborhoods of my father’s time, and my father never lived with uncertainty about “illegal” friends and relatives. In the fall, before the election, the sophomores completed a unit on oral histories and social justice. About a fifth of the students interviewed individuals about their immigration experiences. In one especially haunting interview, an undocumented woman eloquently described her pervasive feeling of shame about not being a person with full agency. She came here with her father from Guatemala at the age of ten, by her own description, “your cliché immigrant who crosses the border and runs and everything.” She injured her arm on barbed wire while crossing, and now, twenty years later, still has problems with it because she never received proper medical treatment. She worries about being a worthy role model for her two young sons. When she was in high school, she had no Social Security number to use on applications for college, where she had hoped to study child development. Instead, she worked for years in manufacturing. She could not even buy Sudafed cold medicine for her sons without a proper identification card, because the over-the-counter medicine contains a controlled substance. She has also been socially isolated; she couldn’t enter clubs with friends if she was asked for proof of age at the door. “I just didn’t have the right documentation to show who I am as a person,” she said. “My insecurity, my instability, my anxiety have completely shaped my life,” she admitted. When I used to read Of Mice and Men with the freshmen, my students had an instant affinity for the 1937 classic. George and Lennie’s transient existence, their migrant experiences, reminded the freshmen of their relatives who had come to this country seeking jobs and a stable life. In our class discussions, nobody questioned the two men’s quest for a homestead or their complicated loyalty to each other. Even after finishing the book and discussing the concept of the American Dream (including who is left out of it), the freshmen still saw the novel as a realistic, timeless chronicle of ordinary, hard-working people who understandably fantasize about “living off the fat of the land.” Now, more than ever, those students must also see the novel as a reflection of their beloved nation’s hostility toward striving outsiders and its indifference to their sacrifice. *Note: Names and identifying details have been modified throughout to protect privacy of sources.